WORK ZONE DIGITAL CALIPER. DEPTH GAUGE. 5 MINUTES OF NON-USE. 5-DIGITAL LCD DISPLAY. Panaflo DC Brushless. Model: DC12V 0.2A. Small orders are no problem. Condition: Used. Joseph Fazzio, Inc. Surplus Division. We are located in Anaheim, CA. Misc Information. Not available for this item. MADE BY JFW. DC TO 2 GHZ. 300 WATT 30 dB ATTENUATOR. CHECKED GOOD. MODEL 50FH-030-300-2. 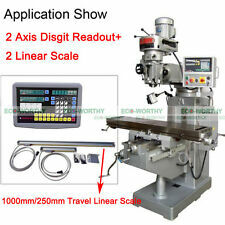 2 Axis Digital Readout Dro Kit for Milling Lathe Machine W/ Precision Linear Scale. In total ,it is a mutlifunctional 2 axis DRO can be use on lathe machine, mill machine and other machines. 1:zero clearing. Item DC Permanent Magnet Motor. Motor Design DC Permanent Magnet. Motor Application Variable Speed. Motor Enclosure Design Totally Enclosed Nonventilated. Motor Mounting Type Face/Base. Motor Thermal Protection None. 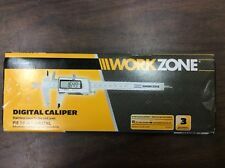 MINT CONDITION WORKZONE DIGITAL CALIPERS WITH CASE. It does not look like it has ever been used and in very good condition. We take pride in the products and services we provide. /Location: MBA-25B. Part/ Type No This does not apply to machines sold “as is” or “subject to inspection.”. Every effort is made to note any missing hardware / manuals / inserts from NIB and NEW products; however, in most cases it is not known what was originally included. Aventics Pneumatic Valve Coils, 24V DC, 10 Watt for sale. Made in Germany. We have no responsibilities or liabilities for manufacture, installation or use of these products. This sale is for a DTS 100 DC-4 GHz 30 dB. We will also never change. We try to describe our item’s to the best of our knowledge, and technical experience. 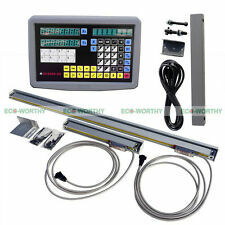 2 Axis Digital Readout Dro Kit for Milling Lathe Machine W/ Precision Linear Scale. In total ,it is a mutlifunctional 2 axis DRO can be use on lathe machine, mill machine and other machines. 17:lathe function(match). FAIR RADIO SALES. Other images were obtained from NASAJPL-Caltech. 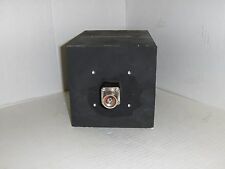 Up For Sale Is (1) Raycap DC6-48-60-RM Surge Protective Device. Manufacture: Raycap. Manufacturer: Sunon. Spartanburg, SC 29303. At Your Service. This does not apply to machines sold “as is” or “subject to inspection.”. Every effort is made to note any missing hardware / manuals / inserts from NIB and NEW products, however, in most cases it is not known what was originally included. NS2 / NSB2. Auctiva's FREE Counter. Get Supersized Images & Free Image Hosting. Computer Board. B.D # C-8940-349. Manufacturer: Lutze. We take pride in the products and services we provide. Every effort is made to note any missing hardware / manuals / inserts from NIB and NEW products; however, in most cases it is not known what was originally included. We are an electronics recycling firm dedicated to keeping good parts out of landfills. k v ( 1563. ) 2018-08-17. excellent service and product p r ( 421. ). 10% off in you will buy 10 modules. Trying to work through a pile of electrical stuff. 80 pcs of boxed 48vdc bulbs 1/4 the list price. Hope you can use them. Priced to go. Raycap DC2 Type 2 Brand new never used. 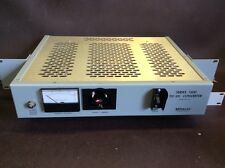 ALFORD DC-18 GHz FREQUENCY RF MICROWAVE AS IS BIN#FI-V-67. NO LOCAL PICK UP allowed. We have only 8 of these. Its been tested and works well. Counts down from 99min to hundredths of a second. Model # : DC-10T-DN-BCD-Custom. More Information If you do not have an account No Worries! SKU# SB-095215. RTG: 0 - 100MV. VOLTS: DC Millivolt. We take pride in the products and services we provide. /Location: MBA-25A. This does not apply to machines sold “as is” or “subject to inspection.”. Every effort is made to note any missing hardware / manuals / inserts from NIB and NEW products; however, in most cases it is not known what was originally included. This is a DC to DC isolated voltage converter. The input is 9 to 36 volts and the output is 5 volts. The converter is rated at 3 amps. The converter has been tested and works well. The input is on the left side and the output is on the right. The board comes with terminal blocks for easy hook up. This appear to be very nicely built and is marked 13973 ASSY 126649-100 nice unit for a project of use on this test unit. YOUR PURCHASE IS FOR A BRAND-NEW, CUSTOM MADE, AND FULLY GUARANTEED, DRCO BRAND, MODEL RR-100A, DIGITAL PROGRAMMABLE DC POLARITY REVERSING RELAY, ALL IN NEW CONDITION (SEE ALL OF THE PHOTOS FOR DETAILS). THIS COMPACT UNIT PROVIDES A MEANS TO AUTOMATICALLY REVERSE HIGH-CURRENT DC POWER POLARITY TO ANY LOAD ON A CONTINUOUSLY REPEATING AND PROGRAMMABLE BASIS. THE DC POWER SOURCE THAT IS CONNECTED TO THE REVERSING RELAY MUST HAVE A REMOTELY CONTROLLABLE "CONTACT-CLOSURE" "OUTPUT-ENABLE" FEATURE THAT TURNS ON AND OFF THE DC OUTPUT OF THE POWERS SOURCE. We have no responsibilities or liabilities for manufacture, installation or use of these products. You are buying (1). If warranty stickers are removed, this will void any warranty. Local Pick Up Available. Model: 4Z528. SOLD AS IS/WHERE IS. Amb. : 40ºC Cont. Freight may be booked with anycarrier, butusually goes out on the best available. Rigging and Hauling Fees are not included in the Asset Sale Price. 1 Canon, 2 NMB and 1 is Jamicon.